Available in 12 colours click here to see them. 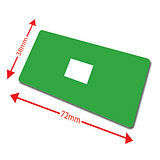 This pack of labels contains 100 labels and each one is 72mm x 38mm in size. Designed with a white box in the centre of the label, the dewey decimal classification number can be added making your books not only colour coded, but they will be in line with the dewy decimal system. FUN FACT - The Dewey Decimal Classification (DDC), or Dewey Decimal System, is a proprietary library classification system first published in the United States by Melvil Dewey in 1876. Buy as part of a money saving value pack by clicking here.